Drive Out ICE -- Migra Go to Hell! 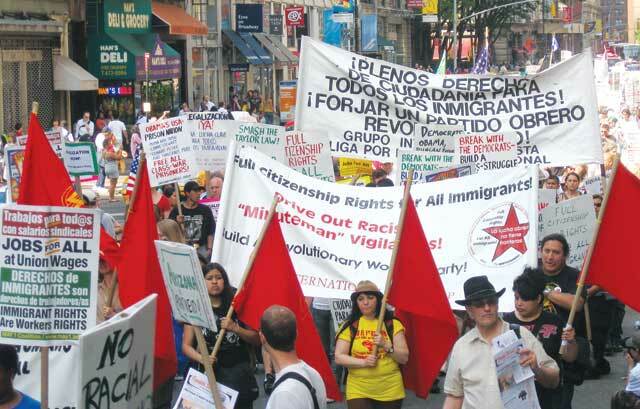 Internationalist contingent at New York City May Day march from Union Square, 1 May 2010. Democrats, Republicans – Enemies of Immigrants! Build a Revolutionary Workers Party! In May 2010, then-governor David Paterson quietly issued a “memorandum of understanding” signing New York state on to the Department of Homeland Security’s “Secure Communities Program.” This followed the signing of Arizona’s infamous Senate Bill 1070, a racial profiling law that allows police to arrest suspected “illegal” immigrants based on their appearance. Anyone who “looks Mexican” could be subject to arrest. The Arizona law was widely protested in New York and across the country. Now a similar law has been passed by Georgia. The CUNY Internationalist Clubs and the Internationalist Group joined protests against the racist Arizona law. But while many on the left pointed the finger of blame exclusively at right-wing reactionaries, we warned that a far greater danger to undocumented immigrants is the federal government, which under Democrat Barack Obama is deporting far more people every year than Republican Bush ever did, and jails many more immigrants than notorious Arizona sheriff Joseph Arpaio. “Secure Communities,” a nationwide program passed under the Bush administration and expanded under Obama, is part of the ongoing racist attack on immigrants. It establishes a system that allows ICE (Immigration and Customs Enforcement of the Department of Homeland Security) and other federal agencies to work with local police to arrest and deport more undocumented immigrants. This has already led to an escalation of unjust incarcerations and deportations of immigrants living in the United States. Under this program, fingerprints and other biometric data of every person arrested by local or state police in cooperating districts are sent electronically to federal immigration authorities and get automatically run through an ICE database for comparison. Over 750 jurisdictions in 35 states have joined the program. This poses a huge threat to immigrant communities and will inevitable break up families and separate children and parents. While the feds whip up fears of “criminal aliens,” in fact those charged with violent crimes are much less likely to be deported than those accused of minor infractions. An October 2010 study of “New York City Enforcement of Immigration Detainers” by Justice Strategies found that only one-third of non-citizens charged with A-1 felonies (the most serious) were put on hold by the ICE, over half of those held on class A misdemeanors were detained, for an average of two and one-half months longer than those not held for immigration reasons. Moreover, ICE’s own records reveal that nearly 79% of individuals deported nationally from October 2008 through June 2010 had no criminal record or were arrested for minor offenses like traffic violations (New York Times, 18 August 2010). There was even greater alarm when it was reported that ICE agents were already present in the infamous Rikers Island jail, despite NYC Executive Order 41 supposedly prohibiting cooperation with federal immigrant authorities. Through the Criminal Alien Program (CAP), agents were permitted to check the immigration status of inmates. According to the New York Times (10 November 2010), “Officers comb through lists of foreign-born inmates, then question, detain and deport about 3,200 of them a year.” This particularly affects youth in New York City, as every year more than 13,000 young men age 18 and under pass through Rikers, the largest prison in the country. Democratic politicians and liberal immigration reform groups held rallies at City Hall to protest the ominous Secure Communities program. At the City Council hearings, Democrats Christine Quinn, Jumaane Williams and Ydanis Rodríguez peppered the NYC corrections commissioner with questions about what ICE was doing at Rikers. But in order not to make trouble for Andrew Cuomo, the Democratic candidate for New York governor in 2010, who as NY attorney general was in charge of enforcing the anti-immigrant measure, they waited until after his election. Even then, they introduced a non-binding resolution in the City Council that simply asks the governor to withdraw from the Secure Communities program. This resolution, which would have no effect even if it were passed, was promptly consigned by the Democratic Party-dominated Council to a committee where it has sat ever since. The message is clear: in order to fight anti-immigrant programs like “Secure Communities,” racist practices like the NYPD “stop and frisk” program and ICE police snatching immigrant youth from Rikers, it is necessary to mobilize independently of and against both parties of capital. Many voters in 2008 put their faith in the Democratic Party in hopes that Obama would enact immigration reform that would help undocumented immigrants gain citizenship. The CUNY Internationalist Clubs warned that no such legislation would be passed, not even the so-called DREAM Act, which wanted to use immigrant youth as cannon fodder for U.S. imperialist wars (see article, page 10). In fact, deportations have soared. In the fiscal year 2010, ICE reported 392,862 deportations, an increase of over 23,000 deportations compared with 2008. Prisons are a big money maker in the U.S. (for the capitalists who own them), so are deportation centers! According to the Detention Watch Network, in 2009 the U.S. government detained approximately 380,000 people in immigration custody in about 350 facilities at an annual cost of more than $1.7 billion. Writing in the Daily News (16 May 2008), columnist Albor Ruiz notes that there have been more deaths in ICE custody than at the Abu Ghraib and Guantánamo torture camps combined. We demand that these concentration camps be shut down and that all the detainees be freed, now! For the Democrats and Republicans the Secure Communities Program is a bipartisan decision and their xenophobic vision of immigration “reform.” Democrats and Republicans are capitalist parties and partners in the persecution of immigrants. We say break with the Democrats – Build a revolutionary workers party! Down with “Secure Communities” and the racist war on immigrant workers. Full citizenship rights for all immigrants! While ICE gets free rein inside the jail, GED programs for youth inmates are being cut back. Last year the Island Academy and Horizon were shut down, to be replaced by a program with a much smaller enrollment and a sharply reduced teaching staff. In Rikers, 90% of the inmates are black or Latino. Only 3% are charged with crimes of violence. Many are there because of drug laws which make a crime out of someone’s private activity which is no business of the government. And quite a few are picked up in the NYPD’s massive “stop and frisk” campaign under which youth are stopped on the street, harassed and humiliated by police for no reason other than their race – out of over half a million stops annually, 80% were black or Latino. At a City Council hearing on November 10, city officials said that ICE agents were stationed at Rikers Island for the last 20 years, but they could cite no legal basis for the presence of la migra. And according to Manhattan Borough president Scott Stringer, under CAP the New York Police Department has for at least the last decade routinely “given the Immigration and Customs Enforcement agency the names of all arrestees,” no matter what they charged with or if they were convicted (New York Times, 4 April).